“Shed Songs”, a solo album of original songs, was released in 2016 on the Turquoise Coal label. To be honest I wasn’t really sure I would like it after listening to his earlier Scapegoats CD (The Old A5) a few years ago which I really was not keen on, I thought the production was not that good, way too 60’s sounding for my tastes. I have seen Andy play a fair few times with his band, on his own, and with Matt Sax and you have to admire his work rate, constantly gigging, either with the group of excellent musicians he has assembled around him or on his own at any of the open mics in the area. The younger generation of musicians should take note when they moan about lack of gigs, get out like Andy does, get your name known learn your trade wherever you can, work hard and the gigs will come. On first glance the CD is nicely packaged and the song list is a familiar one for anyone who has watched him play regularly. Starting with ‘Head over Heels’ my worries about the production were soon dispelled as it has a warm, honest feeling about it which runs throughout the record, this may be due to the involvement of Simon Darvell on engineering duties. Simon also plays a plethora of instruments very nicely throughout the CD. Matt Bicknell adds some lovely sax on this as he does on the 3rd track the lovely ‘Sail into the Sunset’ ‘Fantasy World’ ‘Letters’ and ‘Bearded Bard Blues’. ‘Red to Blonde’ is another delicate song which is complemented beautifully by Andy’s son Tom adding slide guitar and backing vocals. Throughout the whole CD the songs gel nicely together and you can definitely recognise each song as an Andy Bob Beaumont composition. Sometimes I get the feeling throughout the recording (also live now and then) that Andy is holding back on the vocals and there is uncertainty in there and I’d love to hear him cut loose a bit. Also I didn’t get the ending track ‘Bearded Bard Blues’, a bit disappointing and repetitive, maybe, as I was expecting something along the lines of The Hot Dawg Assassins ‘Bearded Bard Song’, which I liked, written by Andy’s co-writer on this one, Owain Dalton. “Andy has been shedding songs for as long as I’ve known him (and we both know what a farthing was) but this latest CD is a wonderful distillation of his wide-spectrum talent. His guitar playing has all the familiar assurance and ease evident on his previous recordings (but oh how I envy his renditions of Robert Johnson numbers on some of those!) – he’s in fine voice and his song-writing is at its most exuberant and adventurous. Not a song-writer full of himself and his issues, Andy’s lyrics don’t get bogged down in self-involvement but keep dark realities at the edge of vision and under control. “The clever album cover takes you beyond the focal point of a shingle beach sea fisherman’s shed, to an infinite, cool iced-blue horizon. 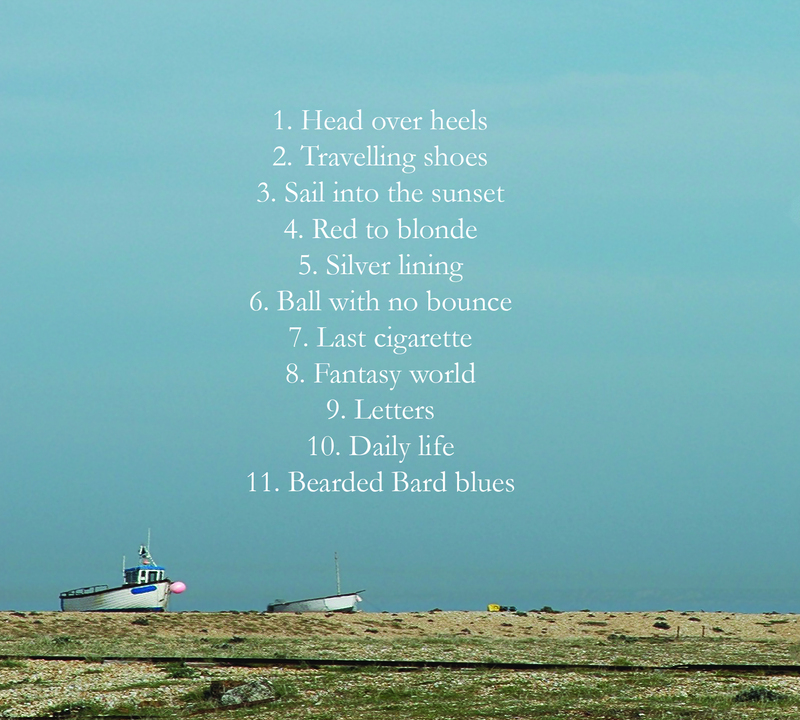 ‘SHED SONGS’ is the latest album by Andy Bob Beaumont and released on the Turquoise Coal label. The cover itself invites you to look beyond your musical horizon and it did not disappoint. Half of all the sales are donated to the M.E. Association which is a charity that helps those suffering from M.E. (Myalgic Encephalomyelitis) which promotes both the physical and bio-medical research into the illness. This is the measure and generosity of Andy Bob himself who seems forever out and about on the North Wales, Folk, Roots and Acoustic scene either by himself or with ‘Scapegoats’ and ‘The Beaumont Brothers’. A beautiful guitar introduction takes you straight into ‘Head over Heels’, which is a song that captures the excitement when you find yourself head over heels in love with ‘the One’. The catchy chorus compliments a most wonderful saxophone solo from Matt ‘The Sax’ Bicknell. ‘Travelling Shoes’ is a venture into the blues where the laid-back ‘optimist’ in the relationship gets the ‘pessimist’ to go. ‘Sail into the sunset’ has a lyric that asks questions to break-free from personal circumstance with great trust and re-assurance and takes you on to the Dylanesque ‘Red to Blonde’ to which it’s simple melody, coupled with some superb slide-guitar, enhances Andy Bob’s vocals. Anyone who has been in a spiral of self-doubt and had to seek solace with a ‘soul mate’ can relate to this most superb track. ‘Silver lining’ is about breaking free from your inner demons with self-motivation and the power of positivity. If the drums and bass don’t get your feet tapping then nothing will. This takes you on to ‘Ball with no bounce’ which for me is proverbial ‘two fingers’ at the cards life has dealt to you and the undeniable and unconditional love for a special person. If you have ever been on an emotional roller-coaster with someone and found that true love has run its course then ‘Last cigarette’ is the reality check that the flames of love are finally extinguished. This takes you on to ‘Fantasy world’ where another majestic saxophone solo canters alongside a jazzy beat. I can describe this track alongside the lines where Paul Weller’s Style Council meets the Modfather’s Stanley Road solo album, and I mean this as a compliment. I found this song most unique. ‘Letters’ is a track with some great guitar work and a punchy beat to which Andy Bob personally delivers with the message and realisation that hell hath no fury than a woman scorned! 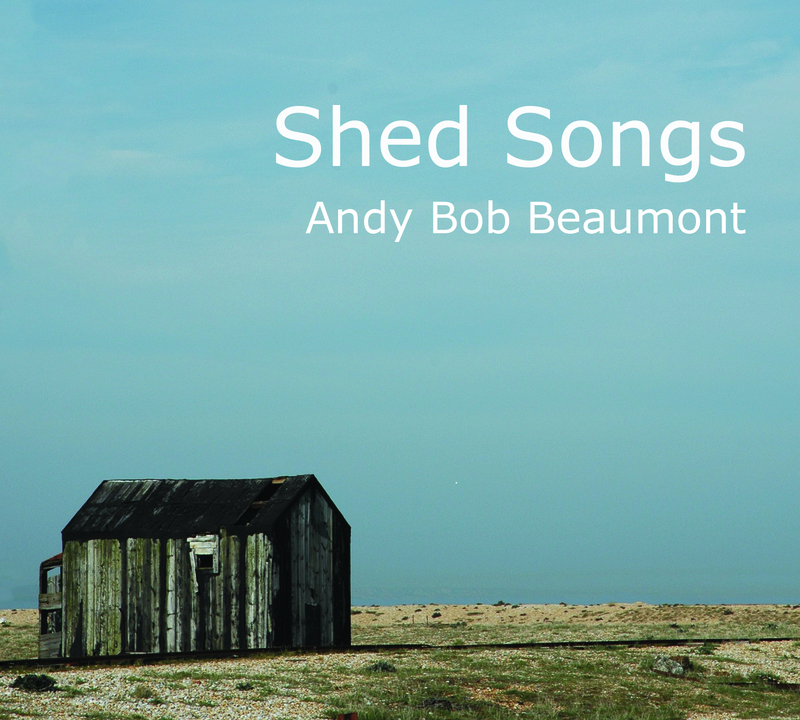 Shed Songs is a solo album by a North Wales’ stalwart Andy Bob Beaumont, who also leads rock/blues band The Scapegoats; you’d never have to scan too far through a What’s On guide in the region to find him or his band playing. The album collects a number of songs that have appeared in his live set, and a group of experienced and able musicians to play them, with Matt Bicknell’s sax especially noteworthy. It has been neatly engineered by Simon Darvell. Metaphorically there’s a feel of relaxed Sunday afternoon beer garden running through the set, rather than raucous Friday night lounge bar – there’s a blues influence but it’s mostly smooth and wry rather than rough-edged and tortured. It opens with the bright, almost upbeat Head over heels, qualified because there’s a slight twist in the song’s narrative, and this is followed by the most musically elemental song here, the blues of Travelling shoes. Three songs in and Sail into the sunset is an amiable track about taking the chance to make a fresh start, then the slightly world weary Red to blonde has a lovely picked guitar line – leading to Silver lining, with a lyric about digging yourself out of the clouded blues by making yourself see a silver lining. Perhaps the most personal track here is Ball with no bounce, which is a heartfelt song about attitudes to the ME his wife has suffered – it’s questioning rather than angry, but you can sense the frustration behind it. More abstractly Last cigarette is a rueful track about a relationship that starts with all the necessary electricity but flounders – whilst Fantasy world reflects on the delusions of painfully unrequited love. Daily life has the ring and sound to it of early seventies singer songwriters, and is about the world still going about its business on the day when a friend dies. Shed Songs closes with the shuffling, rolling blues of The Bearded bard – it’s an album that grows on you quickly, and in truth it does it just as much because of the warmth of character and worldly wisdom it presents, as for the music. Copyright © 2016 Andy Bob Beaumont, All Rights Reserved.